UCL Bracket Predictions for 2018: Who Will Reach the Pinnacle of European Soccer? Soccer fans love the Champions League. It is one of the few tournaments that encapsulates the world, simply because it boasts the most talented clubs on the planet. From mid September through to December, we are treated to 96 enthralling encounters although the real action starts in February when the competition is cut down to just sixteen teams. And so here we are - on the cusp of the Round of 16 and still no closer to knowing who is going to win the tournament. Prior to the start of the season, we predicted that Paris Saint-Germain would finally gel in Europe and win the competition for the first time in their history, although that theory is seriously under threat as they have drawn Real Madrid, who have won the last two Champions League titles. We are guaranteed to see some heavyweight casualties at this stage. 2012 winners and reigning Premier League champions Chelsea take on five time winners Barcelona, while last year's finalists Juventus will battle it out with Tottenham, who have already defeated Real Madrid in this edition of the tournament. There is also the possibility of at least three English sides making it through to the quarter finals given that both Manchester clubs and Liverpool will start as heavy favourites in their respective ties. So how is the market looking now that the Round of 16 draw has taken place? Who are the big movers? Below we take a look at the odds from September compared with right now. Real Madrid were heavy favourites to win their third consecutive title, while PSG, Bayern Munich and Barcelona were seen as their nearest rivals. Manchester City was way out at +1100, while Tottenham was seen as almost no chance, priced at +4000. What a difference a few months and a favourable draw makes. Manchester City have come down to just +333, while Real Madrid have blown out to +800. 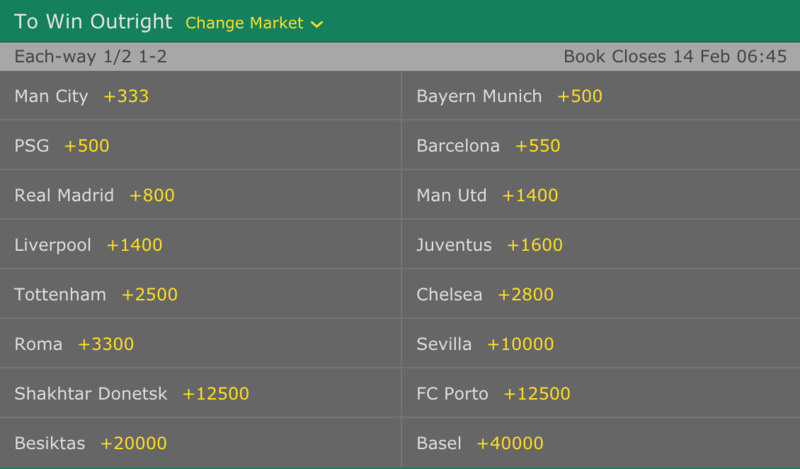 Incredibly, Swiss champions Basel are at even longer odds now despite making it to the second round. With the English Premier League title already all but sealed, and with a generous Round of 16 draw ahead of them, could Manchester City be on the way to their maiden Champions League triumph? The bookies certainly think so. Their movement in the market is huge and well justified - they have been practically unbeatable in 2017/18 and continue their march toward an unprecedented league and cup quadruple. Basel may be Swiss champions, and did manage to beat City's cross-town rivals Manchester United, but simply do not stand a chance against Pep Guardiola's men. The sky blues will be in the quarter finals - the question is, can they beat the other leading contenders when it counts? Munich have dominated the Bundesliga once again, already eighteen points clear, and therefore can focus almost solely on their Champions League campaign. 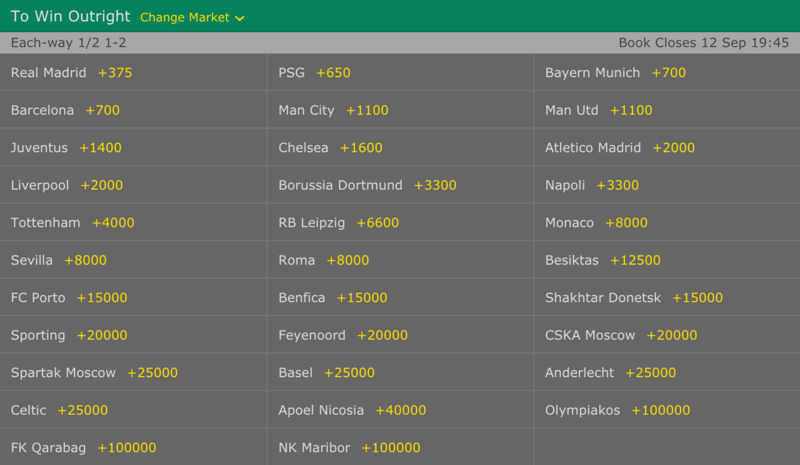 They too have been gifted a relatively easy passage to the final eight, coming up against Turkish giant Besiktas, and are justifiably placed on the second line of betting. Last year they failed to overcome Real Madrid, although if PSG can knock them out it may pave the way to success for the Germans. When we predicted that PSG would win the 2017/18 Champions League, we pointed to their tremendous attacking power and quality all over the park. Their biggest threat would be Real Madrid, although in this tournament you don't always need to beat every good team to win the cup. Well, the pair have been drawn against each other, and despite the bookies thoughts, we think this one is going to go the distance. Madrid have not been at their best this season, yet you only have to look at the way Cristiano Ronaldo lifted in the second half of last year's tournament to get an understanding of how much better they get as the year progresses. The winner of this huge Round of 16 clash could well lift the trophy. The La Liga leaders have quietly gone about their business this season. Neymar's transfer saga and their failure to get Philippe Coutinho in September led many to believe they would struggle in this campaign, yet they lead their domestic competition by nine points and are yet to be defeated, and cruised into the second round of the Champions League having conceded just once in six matches. You can't write off any team with Lionel Messi in it, and they are certainly favoured to progress at the expense of Chelsea despite the fact that they have failed to beat the London side in their last seven attempts. Their experience will count for a lot if they get to the quarters, and we'd love to see them come up against City or PSG. The leading sportsbooks obviously believe Paris Saint-Germain is going to knock Real Madrid out of the Champions League, which would result in the Spanish champions' first failure to reach the quarter finals since the 2009/10 campaign. Ironically, it was another French side (Lyon) that knocked them out on that occasion. This is a huge opportunity for the sports betting community. PSG are a great side, but they simply do not have the experience or pedigree at European level when compared to the most successful continental club side of all time. If Real Madrid can get over the line, their odds will plummet back to around the +300 mark to win the title, so if you think they can overcome the French powerhouse, place your bet now. United have drawn a relatively simple opponent in Sevilla, who benefited from some charitable play by Liverpool in the group stage. With a more than likely quarter final appearance beckoning, why have they fallen out of favour with the betting community? Simple - every single one of the teams above them would beat them in a tie. They don't fill you with the confidence that a Manchester United team of old would have. They scored the second most goals in the group stage, and are the only team to beat Manchester City in any competitive fixture this season, yet they also give up 3-0 leads and can't decide on a starting lineup. Coutinho's absence may hurt them, yet they have a tendency to do better against teams who attack them. We are definitely considering a sneaky wager on the five-time champions. Juventus (+1400 out to +1600) - Buffon's Last Chance? Evergreen goalkeeper Gianluigi Buffon recently retired from international football, and there are hints this may be his final Champions League campaign after coming so close to winning it last year. While the Italian giants made the final last season, we can't see them replicating their efforts, and feel as though Tottenham may actually have their measure in the Round of 16. Tottenham remain value outsiders, and while some may argue they don't have the strike power of the other giants left in the draw, they do boast arguably the best striker in the tournament. Kane has been in sensational form, and let's not forget this side did beat Real Madrid. It will be interesting to see how Mauricio Pochettino manages a side full of players who have never made it to this stage of the competition. Chelsea are in the middle of a major form slump, and Eden Hazard has publicly stated that the Champions League is affecting their Premier League performances. Let's hope they have something up their sleeve because they face a Barcelona team that are well-backed to win this Round of 16 tie. Chelsea's only saving grace is that they have managed to upset the Catalan giants a number of times recently. The Italians topped a group containing Chelsea and Atletico Madrid, which is an impressive feat, yet managed just nine goals in the group stage. We believe they will make the quarters considering they face Shakhtar Donetsk, although can't see them going much further. Sevilla, Porto, Basel, Shakhtar and Besiktas have all performed admirably, however we don't see them progressing from the Round of 16. There are sure to be some mouth-watering clashes in the quarters! Make sure you stay tuned for all our upcoming Champions League coverage, including our in depth analysis of each match all the way to the final.